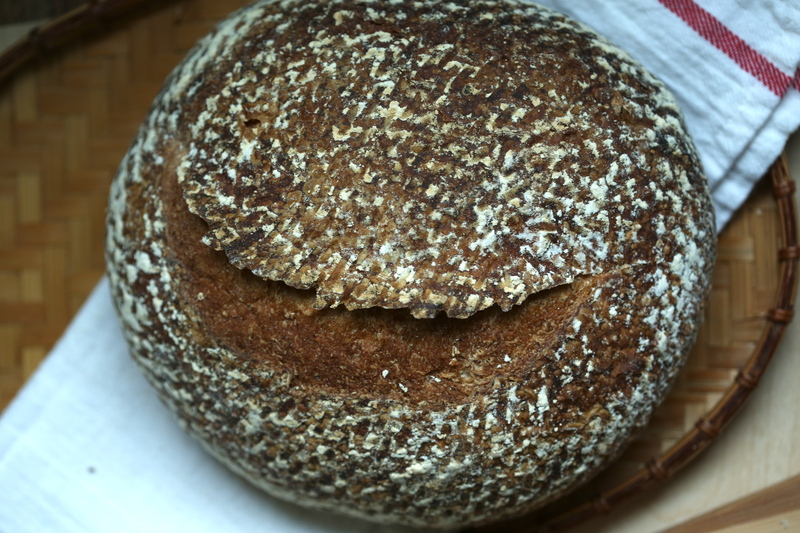 Recently, I picked up a copy of Nancy Silverton’s Breads from the La Brea Bakery. If you aren’t familiar with the book or the bakery, it is a Los Angeles area landmark and a the breads are the type that most home bakers only dream of making. 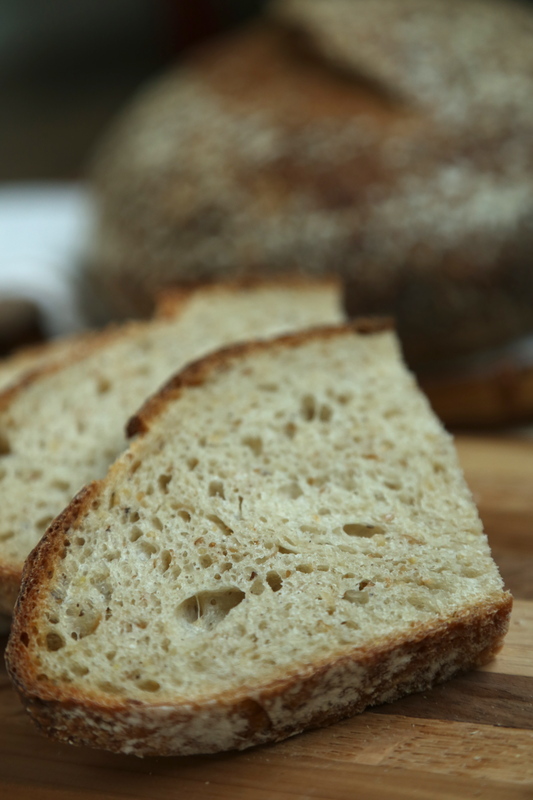 The focus of the book is to start and maintain your own sourdough culture and to use it to make bread using the recipes that follow. Sounds simple but I will warn you, there is not much room for creativity; the procedures and recipes need to be followed closely if you want the loaf to resemble those sold in the bakery. Another note, this book is not for the beginner and to get the most out of it, you really should have some idea of bread baking. That said, I will suggest that if you have had some experience (at home, in a restaurant or a bakery) and you want to take it a step further, pick up a copy of this book and start at the very beginning. This is one of the few books that I feel you really must read all the information that comes before the recipes and then, read it again a few more times. Yes folks, this is more like a textbook and a workbook rolled into a collection of recipes. Personally, making artisan breads leavened with a natural yeast culture is another of those skills I have always wanted to develop but even though I am a pastry chef and I bake for a living, I have never pursued bread baking as a career. Having had some time to spend in my new kitchen, I decided to take my own sourdough culture out of the fridge and try it in one of the recipes. Because there is a need for exact measurements and conditions, I took a cup of my starter and began the process of feeding it as the book instructs. 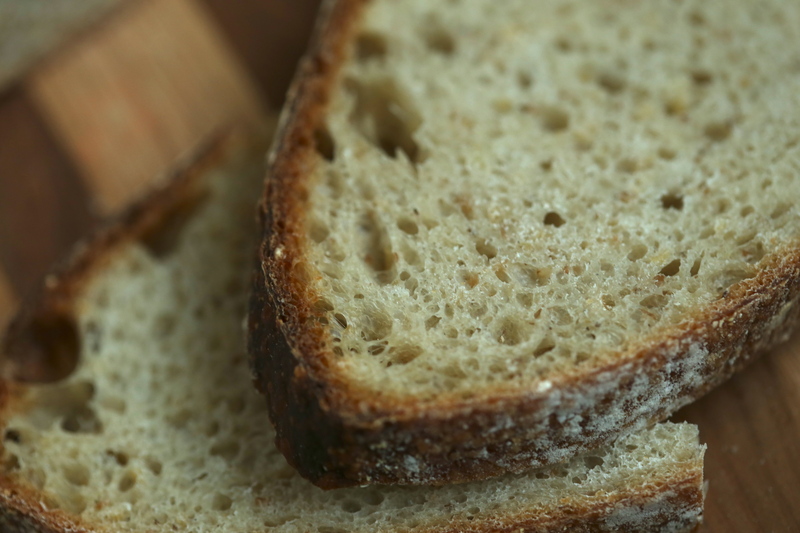 And to test it, I started with the Country White bread, the very first recipe in the book. Nancy instructs you “not to do a thing until you read the recipe carefully and calculate the times involved” and that is just the beginning. This recipe is 14 pages long. Suddenly, I was intimidated and the reasons I have never sought out a job baking bread for a living were staring me in the face. Never the less, I did as told and read, reread and then read the recipe again. 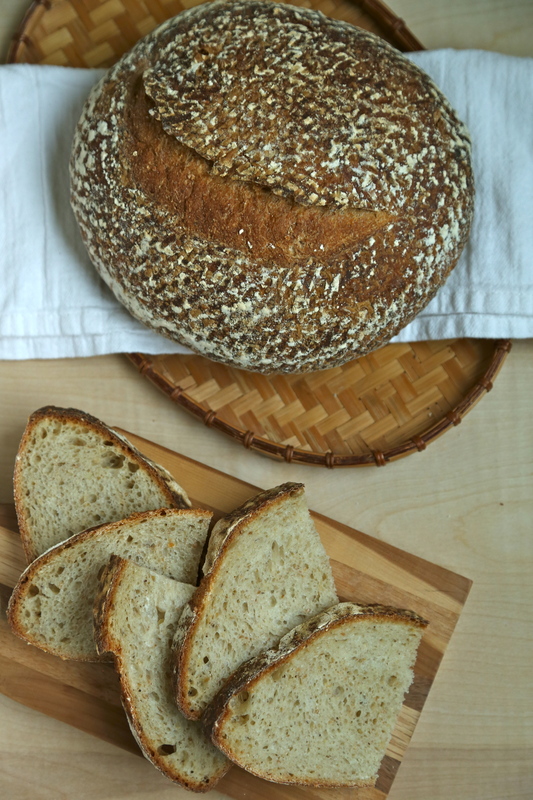 Once I had written out my bread schedule, I got to work on making my first loaf, a two-day bread baking experience. There are so many steps, resting periods and so forth that I would be in danger of plagiarizing the book if I typed it out here so let me suggest that if you want to try making a loaf, get a copy of the book. Truly this book is a worthwhile reference on bread making and it deserves a space on the shelf of serious bread bakers. For a first attempt, I think the bread turned out pretty good and if I judge it by the amount my husband ate that first day, I would say it was a successful attempt. Was it perfect? Absolutely not. Somehow, I added too much flour to the dough and I will say that the way the instructions for mixing by machine are written, they tell you to add the flour, meaning all(measured with a scale-not by the cup) of it at once. It isn’t until several sentences later that it suggests holding some back to adjust the consistency. Too late. My dough was a little stiffer than it should have been and it made the machine kneading process impossible-I could hear my 6 quart Kitchen Aid struggling and switched to kneading by hand. This was not an easy task and I kneaded the dough quite a bit longer than called for. Just as the instructions are involved, so are the ingredients called for throughout the book. A quick glance at a few recipes had me wondering where I could find rye chops and food grade lye near my home. Then I looked at the equipment needed, I really need to find some english muffin rings or tuna cans that can be opened on both ends…This will be a learning experience, a slow one and one I plan to enjoy, one loaf at a time.